Take a walk through Seaside until you see the giant triple-scoop ice cream cone in front of Heavenly Shortcakes & Ice Cream. 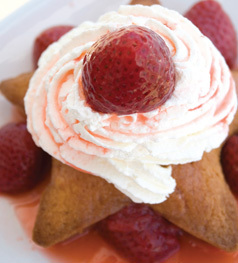 Located in Seaside, Florida, Heavenly Shortcakes & Ice Cream is one-of-a kind. The central location in this breezy beach town makes us the perfect place to pop in on a bright, sunny day. Classic American ice cream flavors, gelatos, strawberry shortcakes and gourmet cookies from our friendly shop beckon a sweet tooth for miles. Cool off with our delicious Blue Bell® ice cream. Enjoy its smooth, light texture on its own or in any number of fun combinations with a variety of nutty and candy toppings. Watch our ice cream girl (or boy) fold-in your toppings right before your eyes. Our organic, locally made creamy gelato a growing favorite, as delightful to the eye as it is tasty to the tongue. You don't have to go to Italy to enjoy authentic Italian ice cream. Heavenly has over 32 flavors to chose from. Dive your spoon into one of our scrumptious signature strawberry shortcakes, topped with fresh strawberries and whipped topping. Or fill up on a satisfying milkshake or float. Whichever sweet treat you fancy, it is bound to be heavenly. Heavenly Shortcakes & Ice Cream opened its doors in 1998 and is named for Heavenly Dawson. The shop is one of four stores of the Dawson Group, owned and operated by Bill and Heavenly Dawson.